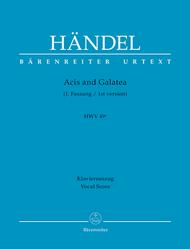 Acis and Galatea HWV 49a (English Masque in three parts). Composed by George Frideric Handel (1685-1759). Edited by Wolfram Windszus. Arranged by Michael Pacholke. For soprano voice solo, 2 tenor voice solos, bass voice solo, STTTB choir, SATB/piccolo, 2 flutes, 2 oboes, strings, basso continuo. This edition: Paperback, Urtext edition. Paperback. First version. Piano reduction. Language: English/German. HWV 49a. Published by Baerenreiter Verlag (BA.BA4039-90).ISBN 9790006507108. With Language: English/German. 27 x 19 cm inches.